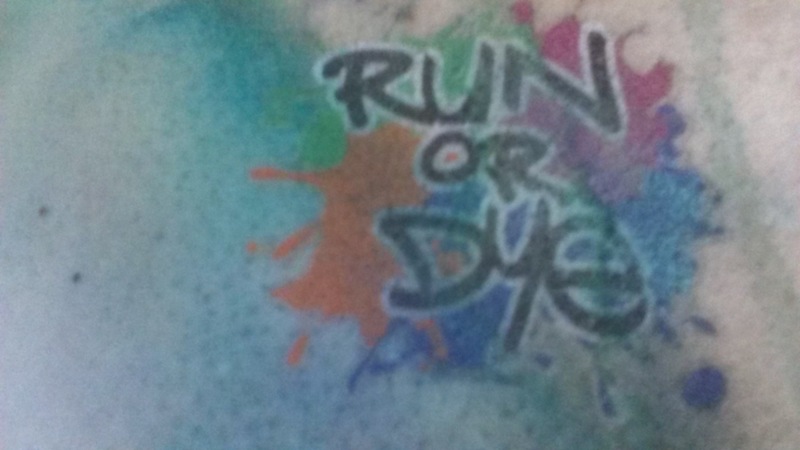 This past weekend I had the great pleasure of running in the Run or Dye fun run! The run was near USC, so we decided the metro would be cheaper and quicker. When we got on the metro, we saw a group of people wearing an awful lot of white (only people desiring to dye their white T’s would adorn). I decided to merge our two groups, and we navigated through the metro together as friends. When we reached the event, the line to register was wrapped around the Coliseum…no bueno. Good thing our new friends were meeting up with the rest of their group. 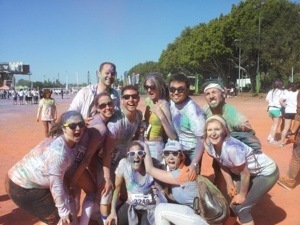 It was a wonderful bunch of people that were totally stoked to get dyed together! They were also celebrating a birthday, which made it that much more fun; very sociable. When we FINALLY got our free packs of powder, we went crazy….before the run, of course. It was a colorful/friendly fire attack on the group. Colors everywhere! Plumes of pink, purple, green, orange and blue filled the air and stuck to every possible exposed part of our bodies. So epic. The line to start the race was as long as the registration line; they were releasing people in heats. Instead of going to the back of the line, our group decided to wait for a heat to pass, run under the tape and start before the next heat came. It was hilarious, and oddly enough, no one cared. It wasn’t timed and no one should run a fun run for time anyway. 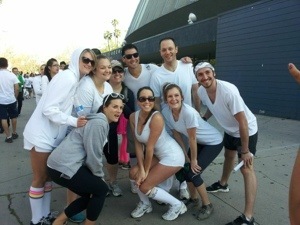 We ran together the whole time (the ones that ran) and made jokes with everyone we passed and with one another. We would pass color stations and get showered with new colors. 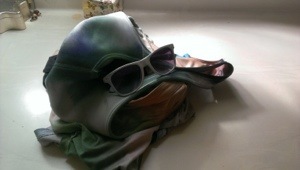 It felt therapeutic and euphoric to find new colors adorned on our shirts..and skin, glasses and nostrils. We finished the race pretty fast. with every inch covered in color, we decided to spread the love and celebrate at Big Wangs downtown. It was a glorious way to end a great fun run. I would recommend everyone try a fun run of some kind this year. It’s a great way to meet new people, enjoy the outdoors and get some exercise. Now, go, be free and full of color!! !